I’ll be at Agile2015 in Washington DC the first week in August. Are you going? Look for me in the Agile Alliance lounge when I’m not in a session. I’ve also got a talk scheduled for Tuesday morning with Mark Kilby: “User Group Dying? Time to Start a State-Wide Learning Network”. And, my boss, Chris Cate (EVP & CIO of Cox Target Media) will be speaking at the nearby Agile Executive Forum. For those of you that go to you conferences looking for some cool new gear, I’ve got great news for you! 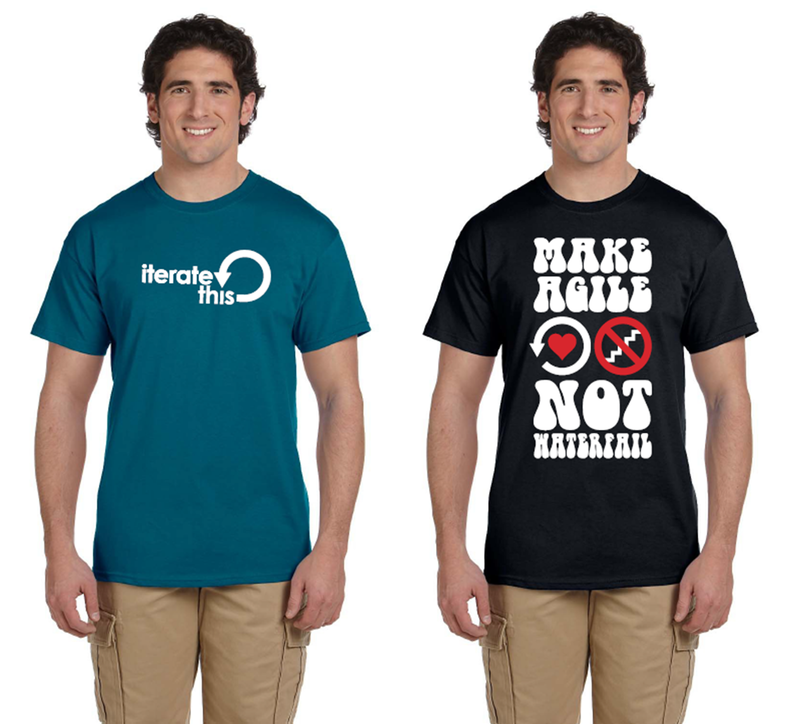 This year at Agile2015, a limited number of cool t-shirts will be available for purchase in the book store. Only 50 of each of these designs are available. Get ’em while they last! 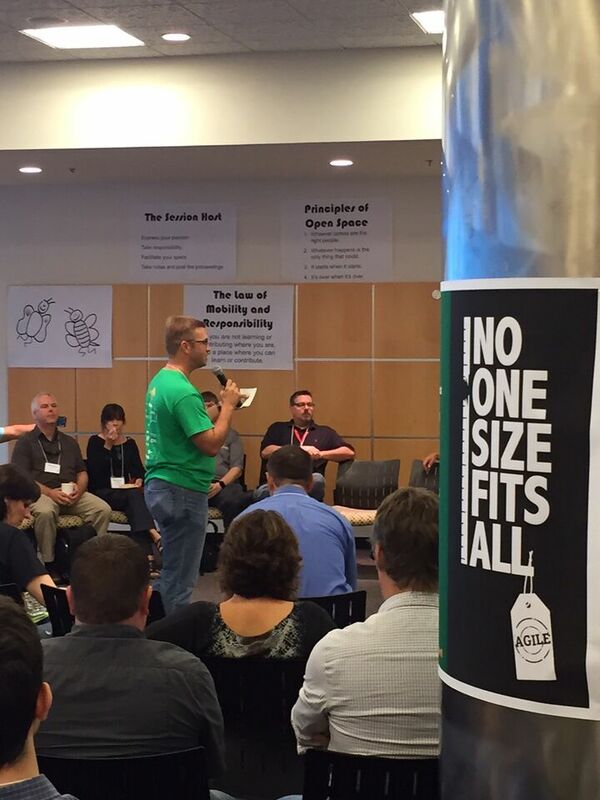 Did you attend OnAgile 2015 on May 14th on “Navigating the Future: Emerging Technical Trends and Practices”? If not, no worries! The virtual conference is still available on-demand until August 14th. Register here and experience the first ever virtual conference of the Agile Alliance at your leisure. Tampa Bay Agile recently welcomed its 900th member. Congratulations Tampa Bay Agile! We have grown by over 900% in about 3 years. This speaks volumes to the state of Agile across the Tampa Bay community. Do you want to speak at an upcoming Tampa Bay Agile meetup? Ping me. We just wrapped up our 2nd annual Agile Open Florida! We had close to 200 attendees from all over the state of Florida. A recap with notes, photos, and a quick video can be found here. It was incredible how relevant the “No One Size Fits All” theme was. Well, I made the finals in the Technology category for the Tampa Bay Business Journal BusinessWoman of the Year. I must say that use of the words “dominant” and “fixture” is quite strong, but I’ll take it. I’m honored to be up against friend and fellow BusinessWoman, Joy Randels, (again) too. Follow-up (update) to the original video that was done in 2012. Many of the people that appeared in that video are no longer with the company and we are further along in our Agile journey now. This entry was posted on Tuesday, July 14th, 2015 at 7:29 pm	and posted in Uncategorized. You can follow any responses to this entry through the RSS 2.0 feed. « Beginning an Agile Transformation at Your Organization: Shu-Ha-Ri?